Seventy-five Jews from Har Brakha visit Temple Mount on Sunday morning. 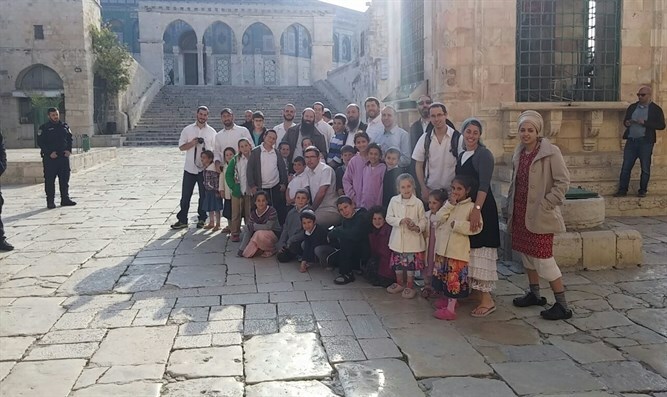 Seventy-five parents and children from the Samarian town of Har Brakha ascended the Temple Mount on Sunday morning. "The children woke up very early in the morning - before the sun even rose," the organizers told Arutz Sheva. "They were very excited to join their parents and to celebrate Pesach (Passover) on the Temple Mount. "We are meriting to ascend the Temple Mount in a large group of both children and adults. We will see the place where our Holy Temple once stood, and fulfill the Torah commandment to make a pilgrimage during the Pesach holiday. "Thanks to the local police, the visit went smoothly and well, as is fitting for a visit to such a holy place." The group in question has been visiting the Temple Mount during the holidays of Pesach and Sukkot for the past ten years, and intends to continue doing so, while paving the way for other Israelis to do the same. Rabbi Gur Golan, who was also one of the group's leaders, said, "We were excited to see tens of thousands of Jews making their way to the Western Wall plaza this holiday. May we merit to see the same on the Temple Mount, with the rebuilding of our Holy Temple speedily in our days."